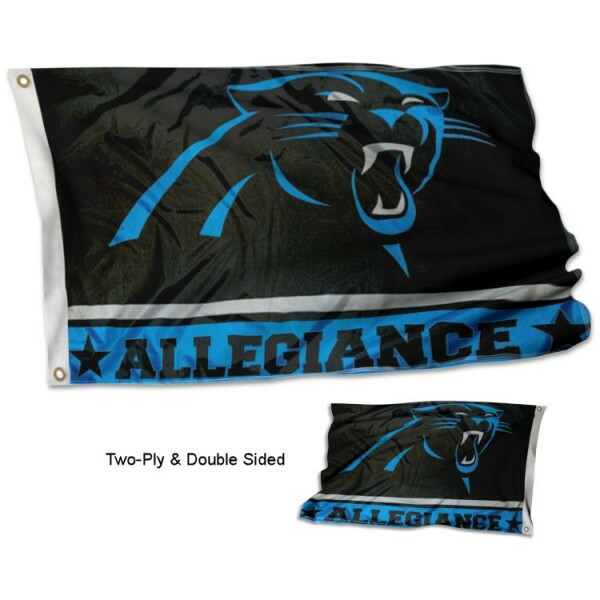 Our Carolina Panthers Allegiance Flag is made of 2-ply polyester with liner, has quadruple-stitched flyends, measures 3x5 feet, and has two metal grommets to attach to your flagpole or any of our 3 sizes of tailgating flag poles. In addition, this quality flag has a liner sewn between each side so the NFL Officially Licensed team logos are viewable and readable correctly on both sides. Show the neighbors your allegiance with our Carolina Panthers double sided Flag and proudly fly with our tailgating flag poles or as a house flag with our aluminum 6' flagpoles and adjustable aluminum flag bracket.